Terms, Payment and Conditions of Sale – COPAKE AUCTION INC.
All property must be removed from the premises by 10:00 am on the following day after the sale unless other arrangements have been made with the auctioneer. Purchased items will be stored at a Copake Auction facility free of charge for (30) days after the auction. On the 31st day the items will be moved to an offsite storage facility to which they will incur Storage Fees. 1. Some of the lots in this sale are offered subject to a reserve. This reserve is a confidential minimum price agreed upon by the consignor & COPAKE AUCTION below which the lot will not be sold. 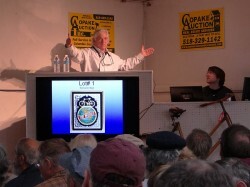 In any event when a lot is subject to a reserve, the auctioneer may reject any bid not adequate to the value of the lot. 2. All items are sold “as is” and neither the auctioneer nor the consignor makes any warranties or representations of any kind with respect to the items, and in no event shall they be responsible for the correctness of the catalogue or other description of the physical condition, size, quality, rarity, importance, medium, provenance, period, source, origin or historical relevance of the items and no statement anywhere, whether oral or written, shall be deemed such a warranty or representation. Prospective bidders should inspect the merchandise thoroughly before bidding to determine its condition, size and whether or not it has been repaired or restored. All sales are final & refunds will not be given. 3. The auctioneer reserves the right to withdraw any merchandise before the sale and shall have no liability whatsoever for such withdrawal. 4. The auctioneer will be the final judge as to who is the successful bidder. 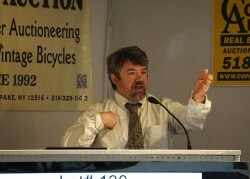 In the event of any dispute the auctioneer shall at his discretion decide to reopen the bidding or not. 5. As a service to our customers the COPAKE AUCTION will execute absentee bids if so authorized in writing. Absentee bids should be made on the Bidder Form available in the office. This form should be clearly and completely filled out. All absentee bids will be executed competitively during the sale. Items will be purchased for the lowest price possible regardless of the amount of the order bid. Where two absentee bidders bid the same amount the first received will be honored. This service is offered as a convenience and COPAKE AUCTION will not be responsible for any errors or failures to properly execute the bids. 6. On the fall of the auctioneers hammer, ownership to the offered lot will pass to the highest bidder acknowledged by the auctioneer, and as such the bidder assumes full risk and responsibility and will pay the full purchase price of the item (s). 7. All items are subject to a 18% buyer’s premium, 23% buyer’s premium for LIVEAUCTIONEERS, INVALUABLE and AUCTIONZIP which will be added to the successful bid price and is payable by the purchaser as part of the total purchase price. 8. All items are subject to an 8% sales tax unless the purchaser possesses a sales tax exemption number. 9. All accounts are to be settled by the end of the sale. We do not accept checks from first time buyers unless accompanied with a bank letter of credit or previous approval from the auctioneer. Payment may also be made by cash, Travelers Checks, MasterCard or Visa. 11. 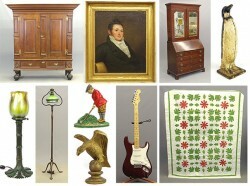 Bidding on any item indicates your acceptance of these terms and all other terms announced at the Auction Gallery.